The Luer-Lok Syringes with Detachable Needles have provided clinicians with the latest advances in retracting technology. These syringes with detachable needles also have plastic barrels with glass-like clarity and the color-coded plunger rods provide faster identification. The new thinline stoppers and bold scales on the syringes are able to make more accurate dose measurements possible. Bold markings for measurements on the syringe barrel. Volume: 3 mL or 3 cc. Durable. Safe. Economical. Lightweight. Easy to Use. Portable. Fantastic product and service. !! Product is safe and easy to use. by Ronnie from New Orleans , LA. Safe. Durable. Lightweight. Easy to Use. Portable. Sturdy. Economical. I take B12 injections that I administer myself. 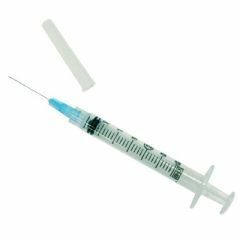 The needle is small enough to break the skin without hurting or causing bruising. 16 or 18 gauge is fine for PG liquid, but if you're also using VG, you'll need a 14 guage because glycerin is much thicker than PG. I find the 14 gauge blunt-tip needles combined with 3ml, 10ml & 20ml syringes are perfect and all you'll ever need for most e-liquid tasks! Hope this helps! You need a very large needle. Much larger than 18 gauge. Look on ebay for meat syringes. These needles have several holes along the side in order to penetrate the meat in several spots at once. They are not disposable, but easy to clean. Don't understand the question but these syringes anr great.